The suggestion has been made by Cork Fine Gael TD Jim Daly as a means of preserving rural bus services. 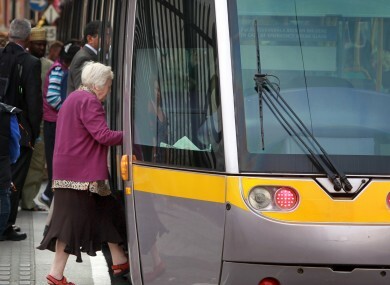 YESTERDAY, FINE GAEL TD for Cork South West Jim Daly suggested that people with a free travel pass in Ireland should be required to pay a €6 fee to help ease Bus Éireann’s ongoing financial woes. With about a quarter of the population of Ireland, 1.2 million people, entitled to free travel (although the numbers who actually possess a pass are less clear), Daly’s thinking is that an annual fee would be enough to wipe the semi-state bus company’s debts clear. This morning it emerged that Bus Éireann believes the jobs of its entire staff of 2,600 people are at risk unless it finds a way of wiping clear its deficit of €6 million. A recent report by consultants Grant Thornton had suggested that the company close its Expressway inter-city service as a cost-cutting measure, a move that would doubtless face vehement opposition across rural Ireland. We’re asking: Should people with a free travel pass have to pay a small charge for it? Email “Poll: Should people with a free travel pass have to pay a small charge for it?”. Feedback on “Poll: Should people with a free travel pass have to pay a small charge for it?”.